One of technology’s most fundamental purposes is empowering people to do more, and that’s why people with disabilities are often the ultimate early adopters. Those of us with more challenges to overcome in work and play may have more to gain by using newly conceived tools or even helping to perfect them. The stories below are about people on the cutting edge of developments in artificial intelligence, gaming, communication and more — all at the powerful intersection between accessibility and technology. Students across the U.K. got to test this new way to learn how to code by touch. Now a nonprofit plans to bring this powerful tool to kids around the world who are blind or have low vision. The Xbox Adaptive Controller allows gamers with a wide range of physical disabilities to customize their setups in whatever ways help them play their best. 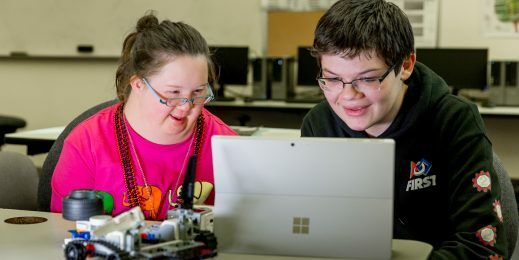 This extraordinary program pairs students with intellectual disabilities with other kids to create robots for a yearly competition. These teams develop useful career skills, empathy and, often, new friendships. His business was booming, but his muscles were failing him. This data analyst didn’t think he’d be able to do his work again — until he discovered a new tool. The Xbox Adaptive Controller was designed for people with limited mobility, so shouldn’t the packaging be as easy to use as the device inside? Joseph Adjei, a college student from Ghana who lost his hearing seven years ago, is using technology to help him follow classroom lectures.